Sometimes we cry to get back the previously copied data to our clipboard. On windows, this is not recoverable. But using tools like clipboard master, we can get back that copied data back to our clipboard. A series of keyboard shortcuts can be used (fully configurable) to paste any of a number of clipboard objects to the current document or may be drive or a folder. Clipoard Stores all your texts, files and pictures copied to the clipboard. It can help you to Paste any item in any window application. You can also Define any shortcuts to show the clipboard list (Default is + V). Store often used text snippets in Clipboard Master and they are available in any application with a few keys. Paste the texts etc. in any application. This even works when renaming a file in the windows explorer. 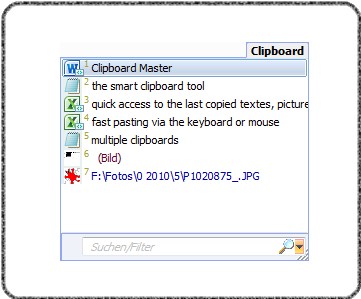 Multi-Clipboard for text, graphic, files / folders..